The weather is warming up and so is the construction season. Perhaps now is the time to install a heated driveway or roof deicing system so you’re prepared for next winter. 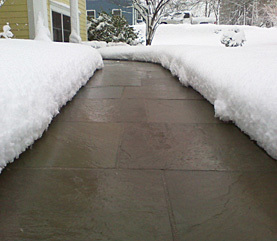 Radiant heated driveways provide fully automated, maintenance free snow removal for your driveway and/or sidewalks. The systems are reliable and easy to customize to best suit your exact layout and snow melting needs. Heated driveways rely on a network of heat cables embedded in the driveway medium. The cable can be installed to heat concrete, asphalt or paver driveways. (Hydronic systems utilize Pex tubing, whereby specially treated hot water is circulated.) 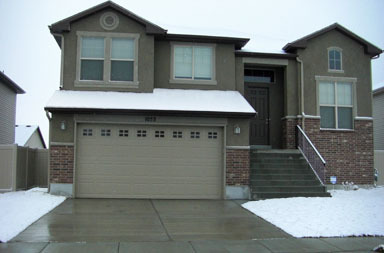 A snow sensor can be installed in the surface of the driveway or mounted near the roof. It must remain exposed to the elements. The sensor detects temperature as well as precipitation, so when weather conditions dictate, the sensor will signal the system controller and then power is sent to the heating cable, warming the driveway. Heated driveway systems are not difficult to install. Warmzone provides complete system design and layout services to facilitate quick, proper installation. This document also includes all the information necessary for the electrician, such as proper materials, load calculations, breaker sizes, number of breakers, etc. The heat cable is laid out according to the design provided. For concrete heated driveways, lay out the cable and then use zip ties to secure it to the re-mesh. (The cable should remain within 2 inches of the surface.) Concrete is then poured over the secured cable. The contactor panel (or controller) is typically mounted on a wall in the garage. Warmzone offers contactor panels with or without GFCI protection. Electric heated driveways feature fast response times. The driveway is quickly heated after the sensor detects the first snowflake, preventing any snow buildup. Another advantage of electric driveway heating systems is that they are maintenance free and very reliable. Unlike hydronic systems that require a special mechanical room for the boiler, manifold and pumps, electric systems only require a small space on the wall of the garage for the controller or contactor panel. Radiant heat systems are also remarkably efficient. There’s virtually no heat loss, as 99 percent of the energy goes directly to melting the snow. The efficiency of radiant heat also makes it a popular choice for heating homes. And the systems are fully automated. The snow sensor, also referred to as an activation device, detects the weather conditions (both temperature and precipitation). Once snow starts to fall the sensor signals the contactor panel and power is sent to the embedded heat cable. The driveway is warmed and snow is prevented from accumulating. In addition to the beneficial features of a radiant heated driveway, Warmzone also includes complete customer support with each system. In addition to the professional system design, Warmzone also offers free installation training. This is a valuable service that helps to ensure the proper installation of the system. Free installation support is also provided. If your installer encounters any issues during the installation, he/she can call Warmzone to receive support. We are committed to providing the best products and best support services in the industry. For more information about our radiant heat systems, call 888.488.9276 today.